In early 2015, the Tri-Council for Nursing, consisting of the American Association of Colleges of Nursing (AACN), the American Nurses Association (ANA), the American Organization of Nurse Executives (AONE), and the National League for Nursing (NLN), in collaboration with the National Council of State Boards of Nursing (NCSBN) determined that a uniform tool (scope of practice decision tree) was needed. Representatives from the ANA, NLN, and Boards of Nursing, along with NCSBN staff, methodically reviewed the literature and existing decision-making algorithms and used their expertise to develop a uniform tool that would assist nurses and their employers in determining the responsibilities a nurse can safely perform. 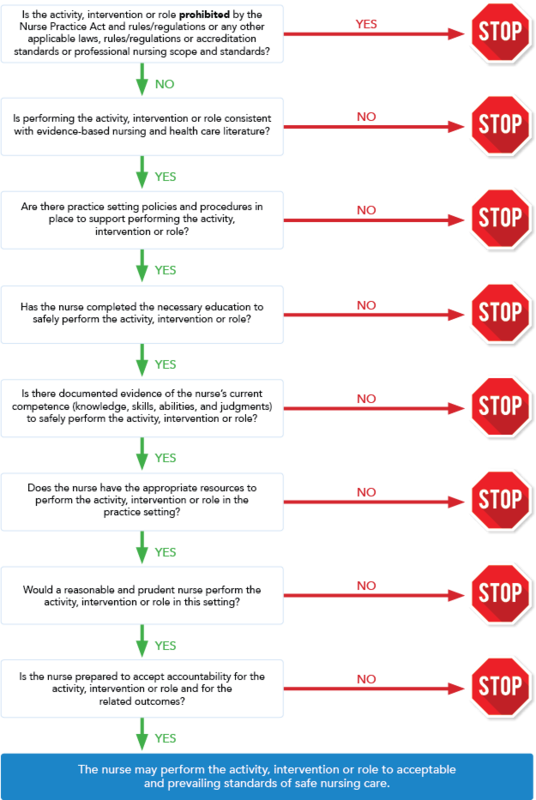 This tool is intended to be used by nurses, facilities, boards of nursing and other stakeholders in determining whether specific activities, interventions, or roles are permitted under the nurse’s level of education, licensure, and competence while meeting the standards established by the nurse practice act and rules/regulations of each state or jurisdiction. Identify, describe or clarify the activity, intervention or role under consideration. These decision-making framework guidelines are for educational purposes only. The guidelines do not purport to establish a standard of care or advise a course of action for patient care in any particular situation.